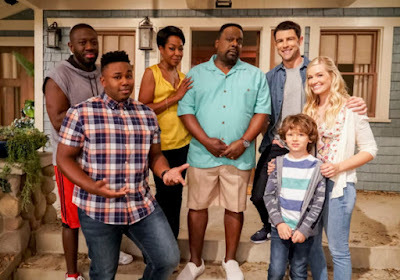 To get us through the summer hiatus, I'm going to be posting a series of Top 10 (or 5, depending) lists, which could include some or all of the following: top episodes overall, top episodes of each season, funniest moments, brotherly love moments, brotherly angst moments, top quotes... I have more ideas for lists, too. I love me some lists, people. 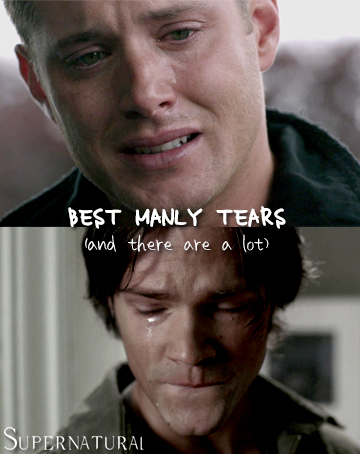 To kick things off, here is my official list of the Top 10 Best Manly Tears! After John abruptly dies at the end of the previous episode, the boys bid adieu to their dad in a funeral pyre - with his body salted too, naturally. The moment is mostly silent but for Sam asking if John told Dean anything before he died, to which Dean of course LIES before letting his one silent tear drop down his cheek. And guys, this is one of the only times where the guys actually cry at the same time. It hardly ever happens, and that's partially why this moment made it into the top 10 above some other options. Sam and Dean get some help from the ghostly form of their father, who has escaped from Hell thanks to the gate being open, to finally be able to kill Azazel (aka the yellow-eyed demon or YED for short). After he sputters and sparks dead to the ground, Dean and Sam have a final, silent, tear-filled goodbye with John before he sparkles away to points unknown. Another rare occasion where we see both boys cry at the same time! And I think John might've been sporting some tears as well. Triple tears! Dean gets to see what life would've been like had Mary never died thanks to a djinn. Although it seems like life is pretty good, he starts to realize that because John never raised his boys to be hunters, everyone they ever saved died. He goes to John's grave (because although Mary was alive in this world, John had still died, though not because of the yellow-eyed demon), and there asks why it's their responsibility to save everyone. Why can't they have a normal life? He wants it so bad, but eventually gives it all up to be the hero. That's our Dean. 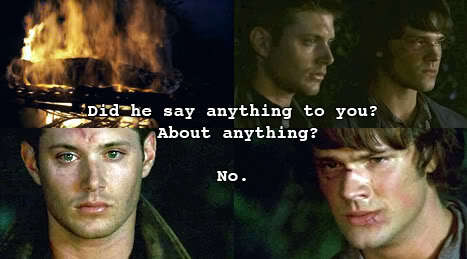 Despite their best efforts, the boys were not able to prevent Dean from having the hellhounds drag him to Hell. While Dean is getting ripped to shreds right in front of him, Sam has to contend with Lillith, who tries to kill him with her white light hand thingy. It doesn't work, though, so she skedaddles before Sam can kill her. After she's gone, Sam's left alone with Dean, who's lifeless and torn to bits on the floor. As he laments his brother, we zoom in on Dean's dead eye, straight down into Hell, where he's strung up in chains and shouting for Saaaaaaammmmm! The boys think they have cured Madison of her werewolfiness, and Sam gets it on with her, only to find out that they didn't cure her after all. There's nothing they can do, so she asks Sam to kill her. Sam has a hard time with the mere idea of this, so Dean offers to do it for him. Sam says no, she asked him to. He grabs the gun, and before he goes to do it, he looks back at his brother, tears streaming down his face. Silent Lucidity is playing on the soundtrack and man, what a beautifully crafted scene. As Sam walks out to do the right thing, Dean lets one manly tear fall down his cheek, then flinches as he hears the gun shoot. These boys can never have any happiness. 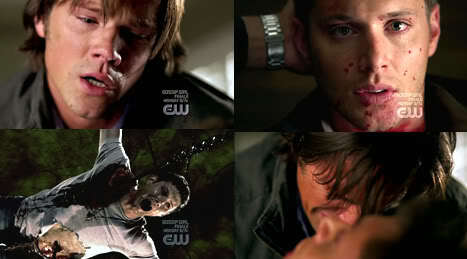 At the end of the first half of this two-parter season finale, Dean's worst fears come true - Sam is killed. Though Bobby tries to keep the sanity, Dean yells at him to get out, and has a one-sided chat with his dead little brother, about how he screwed up the one job he was supposed to do. That is, protect his Sammy. He is at a loss. "What am I supposed to do?!" As we know, he does something terrible that sets off a big chain of events leading to the apocalypse. Whoops. Dean travels back in time to when Mary and John were about to get engaged, and finds out that his mom was a hunter long before John ever started them down that path. In this chat, Mary confesses to Dean that she hates hunting and swears she will never raise her children in that life. Aw man, you can just see his heart breaking at her saying that. He then asks her please, no matter what she may hear, to not get out of bed on that fateful night in November 1983. He wants so badly for her to have the apple pie life she desires, that some manly tears flow. When the angels force Dean to use the torturing skills he used in Hell to torture information out of Alastair, Alastair, instead of telling him who has been killing angels, informs Dean that it's his fault that the seals are being broken. When he started torturing in Hell, that was the first seal to break. After a subsequent major beat down by Alastair and near save by Sam, Dean has a chat with Castiel about what it all means. Cas says that the man who begins it is the man who must end it, but Dean is so broken down at this point he tells Cas to find someone else. GAH. I may start crying of sympathy just thinking about it. After John mysteriously died and the Colt disappeared just after Dean miraculously recovered from injuries that would have killed him, the boys figured something fishy probably went on, though of course they don't actually talk about it for a while. While Sam is dealing with John's death, Dean has been bottling up his feelings about the whole thing, only to finally tell Sam what he's really feeling here in another of their patented roadside feelings chats. He feels like he should be dead rather than their dad, and there's nothing Sam can say to make that alright. After Dean came back from Hell, he told everyone that he didn't remember what happened to him. It quickly became obvious that this was a bald-faced lie, but he wouldn't talk about it, despite Sam's many pleas for him to. Finally, after a confrontation with Alastair, Dean comes clean. And it's so much worse than Sam could have imagined. His pain, and his wish that he couldn't feel anything, is so heartbreaking that it almost makes Sam cry for him (but like I said, Sam's all about teary eyes rather than tears, so we only got the teary eyes here). In conclusion: DEAN! You have so much manly pain. And there you have it. Do you agree with my choices, or do you think I missed a big moment? Let me know in the comments! When Sam has to kill Madison? That kills me. 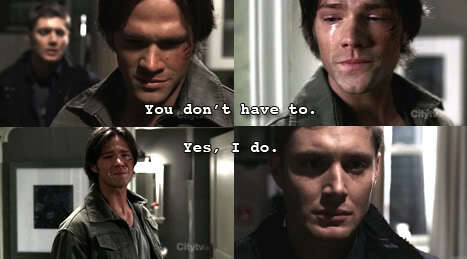 I don't think Sammy's been as teary since. So awful. I cry every time I see it. And isn't Queensryche's "Silent Lucidity" playing then? Kills me! 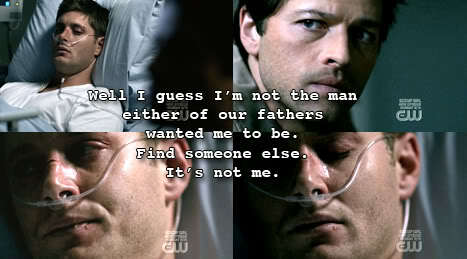 When Dean was talking to Castiel in the hospital and saying how he need to find someone else, that got me. 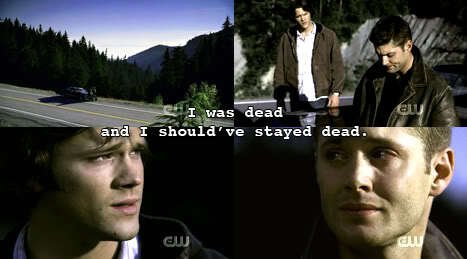 And Dean talking to dead Sammy, that was a good one too. And blessed Jesus....there is someone out there who's not just into SPN but SYTYCD and baking?! @bt-kady - I definitely cry every time they do, too. Aw, boys. @dr-ducktator - Silent Lucidity put that scene over the top! It made it a classic. @dechanter - Love those two, as well. It was hard to rank them! Each of 'em slew me actually. Winchester man-tears FTW! Sammy killing Madison and Dean's confession of hell are the top. I cry everytime they do. Didn't realize that Dean acturally cries more. It seemed like Sam did. @Rea - Yeah, you'd think Sam cried more, but it isn't so. 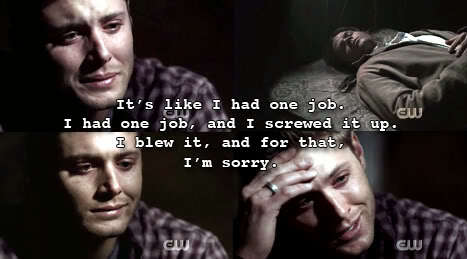 Maybe he gets teary eyes more often, but actual tears goes to Dean. 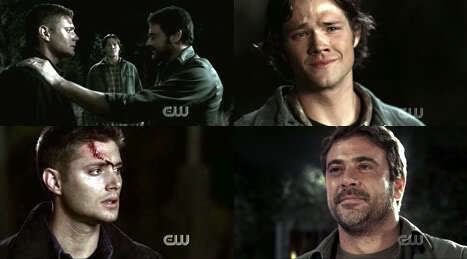 I think the Best Manly Tears was after Famine told Dean he is empty and Sam was in isolation. Madison above dead Dean? Um no. Lol. And no Dead Sam from All Hell Breaks Loose? Great choices, but the one that always gets me is Dean's phone call to John in the episode 'Home.' It's the very first time we see either one of them break down, and at this early point in the series you just aren't expecting tough, wisecracking Dean to EVER cry. I don't really have a 'favourite' crying scene...They're all just absolutely heart-wrenching </3! But I think the first time I teared up (which happens surprisingly often, as I normally cannot cry at anything like tv shows, films, books, ect...) I think was the scene at the start of season 2 where Sam confesses to Dean how guilty he is for always fighting with John and how he thinks John died thinking Sam hated him and Sam knows it all too late now ;_;... But all their crying scenes just get to me...I dunno why, but in terms of emotions, Supernatural seems to get to me more than most other of such fandom feels...Probably because of the boys' superb acting.. I'm late to this game but now that Season 9 is done, honorable mention must be made of Sam weeping actual tears while clutching dead Dean. As for a favorite scene...they ALL get me. Every single one. 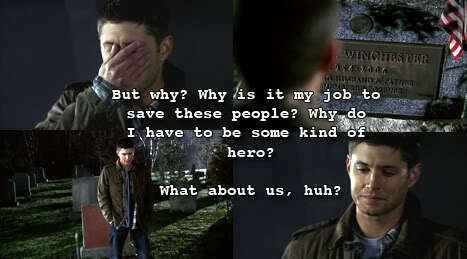 But the one that makes me cry every single time is Dean's confession about the goings on in hell. It just floors me. The feels, man, the feels!! Fun fact: Jensen has told the story a few times of how that scene went down. He says that he acts on instinct, and when his body feels the emotion it reacts even though his brain knows it isn't real. Apparently after the first take of that scene he was shaking and literally couldn't stop crying and he literally had to walk down the street and try to shake it off because they had to do it multiple times (to get all the right camera angles). Jared said that even he had to walk it off, and that the whole crew felt it. Powerful acting, man. Jensen is seriously underrated, IMHO. Love the show, and I agree with all the scenes here being full of manly feels. Yet the only scene I actually bawled at was when Sam/Lucifer was momentarily distracted by a glint off the Impala. And all of Chuck's words in that episode struck me hard - The Impala was their home. The road, the job, each other. They were/are each other's homes. And that single memory, of a toy soldier being jammed into the door, was so strong a reminder of that, them being home to each other, gave Sam the strength to stop hitting Dean and take control. Powerful and touching moment for me.